My second day in the Carrizo Plain National Monmument was a full one, going from sunup to sundown, tagging more than a dozen summits. It wasn't an arduous day by any stretch, with plenty of driving between summits to give me ample rest and quite a few drive-ups. I started the day in the Caliente Range and ended up in the Temblor range on the opposite side of the monument. Most of the hiking was done in the Caliente Range with easy driving, while the Temblor Range had short, easy summits with some rough driving. The peak is the third highest and third most prominent in the Caliente Range, lying about 2.5mi east of the range highpoint, Caliente Mtn. I had hoped to include it with the previous day's tour of five other peaks in the area, but I had run out of daylight and energy. I spent the night camped at the saddle where I'd ended the previous day's hike, getting up in the morning to move the car up a spur road about 3/4mi closer to the peak. This left me with a five-mile roundtrip hike. The first mile is pretty tame with easy hiking in the upper reaches of the Middle and Horse Creek drainages. I then climbed onto the crest of the range via a steep subsidiary ridge, followed by more easy hiking along the crest. There was a mix of clouds and blue skies, cool temps and a brilliant display of yellow flowers in at least three varieties. An old road cut helps some with the last mile, but it didn't make a significant difference. It took me a bit under an hour and a half to find my way to the summit with excellent morning views. Caliente rises more impressively to the west while a fog temporarily shrouded Soda Lake to the northwest. To the north and east stretched the vast Carrizo Plain, with the Cuyama Valley to the south and southwest. I particularly liked the view looking south down the Horse Canyon drainage with the softly-lighted, flower-covered slopes descending to the bottom of the canyon. I left a register at the summit before returning back down the same way, taking less than an hour for the return. I spent the next hour driving back to the Carrizo Plain, southeast on the main Soda Lake Rd, then back into the Caliente Range for a trio of peaks. The road I traveled was in good shape, apparently maintained as a utility road for the transmission line that runs over the range here. The road goes just west of Peak 3,562ft's summit, leaving a 100ft of hiking to reach the rounded top. The road then continues downhill, making a long switchback to reach a a saddle with Peak 3,465ft before climbing up to the second summit. The road goes directly over the top of this one before continuing down into Cuyama Valley. I turned around after passing over the summit, parking near the lowpoint before the road climbs back up to the first peak. Peak 3,900ft, the highest of the trio, lies about 1.3mi to the WSW. I had to hike down into and out of two branches of Quail Canyon before climbing the NE Ridge of Peak 3,900ft. With carpets of yellow and some magenta, on mostly-open slopes, it made for a pictureque hike with fine views. The summit offers a good view of Long BM to the northwest about a mile away, the second most prominent summit in the range. After snapping a few photos from the summit of Peak 3,900ft, I made my way back via the same route, returning around 12:30p. I drove only about half the distance back to Soda Lake Rd before finding a nice track that took me southeast through the rolling hills towards the last two summits in the range. The driving route took me into a lovely, high valley at the head of a drainage emptying south into Cuyuma Valley. I parked at the base of Peak 3,187ft, about 0.4mi away, and about 1.2mi from Peak 3,502ft. Another fork of this road continues down into Cuyama Valley, but I don't think it is accessible to the public from that direction. I chose to visit the further peak first, following a branch of the drainage to the east, with a badlands-like stretch in the upper reaches before gaining a saddle. Though steep on this side, the east side of the saddle drops off gently into another high valley at the head of the adjacent drainage. I crossed this green valley, finding an old fenceline that needed hopping before starting up the northwest side of Peak 3,502ft. I paused at the summit to take in the views and enjoy a rare snack that my wife had hidden away in my daypack. I took a slightly different descent line before crossing back between valleys over the same saddle. I passed by a game guzzler near where I'd parked before heading up the North Ridge of Peak 3,187ft. I left a register atop this summit before heading back down to the jeep. Not surprisingly, I found no registers on any of the day's summits. 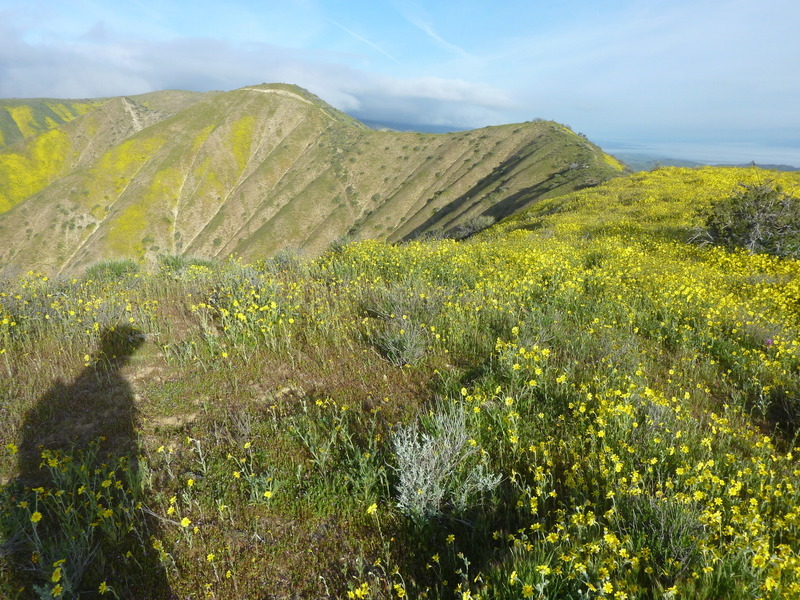 Having finished up with my objectives in the Caliente Range, I next turned my attention to the Temblor Range on the other side of the Carrizo Plain. By now I had reached the southeastern tip of the Carrizo Plain so there was little driving to get from one range to the other. The Elkhorn Hills are a small collection of low hills separating Carrizo and Elkhorn Plains. My driving route to the Temblor Range took me into the Elkhorn Hills with a short diversion to visit the highpoint. There are two closely-spaced points vying for highest. The northernmost one can be driven to, but the southern one is a few feet higher and requires a few hundred feet of walking to reach. The summit had a spectacular view of a large field of purple to the northeast in the Elkhorn Plain, which I visited next. There were several cars parked there, with expensive cameras being deployed to great effect in the idyllic setting.